Dense, earthy nose with black cherry, cocoa and dried herb hints. Full-bodied with moderate acidity and supple tannin – good balance. Cherry, blackberry jam and black currant palate – youthful with mint and licorice notes. Long finish – smooth – tight, showing a nice layered complexity. Drinking well now – should continue to hold for the next 3 to 5 years. Good value. If France is my favorite wine producing country (and this is tough given my penchant for Italian and Spanish wines…), then the Rhone is probably my favorite region within France. 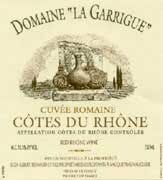 The originator of the wine that smacked me square in the forehead and started me on my wine journey 28 years ago, the Rhone is a region steeped in history and amazing wine. This has certainly been true over the last decade, as the Rhone has had a string of near perfect vintages stretching back to 1994, save one – 2002. The one downside to all these great vintages is that the Rhone is no longer a region of consistent value. 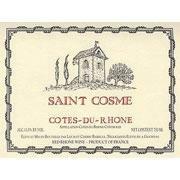 Prices have escalated and what used to be a fine $9 – $10 Cotes du Rhone is now $15 – $20. The wine is still great, the prices not so much… I have posted the occasional find in two recent vintages 2007 and 2009, both regarded as exceptional vintages on a par with the near perfect 1998 vintage and now 2010 wines are making their way to market. Regarded as a very good vintage, 2010 is quietly being referred to by some critics as a “shadow vintage,” meaning that it is following in the shadow of a truly memorable and massively-hyped vintage: 2009. The benefits to a shadow vintage are that the quality is usually very good with somewhat moderate prices and great availability. Earthy nose with dense tarry fruit hints and anise and dried mint leaves. Full-bodied with firm acidity and moderate tannin – good balance. Fruit forward palate with dark berry notes – herbaceous – youthful. Moderate length with a smooth, layered finish. Drinking well – should hold for 3 to 5 years. Fresh, fruity nose with dried herbs and floral hints. 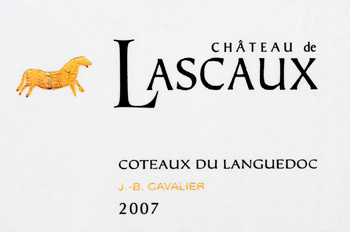 Full-bodied with moderate acidity and supple tannin – good balance. Youthful, fresh cherry palate with tar, rose attar and allspice notes – exotic. Moderate length with a persistently herbaceous finish. Smooth. Drinking well now – should hold for 2 to 3 years. I receive a number of mailings (electronic and paper) from lots of wine outlets, including many on my “frequented” list. One in particular is a real favorite – The Wine & Cheese Cask in Somerville, MA. The Wine Cask is a place of permanence… The small, cramped store has not changed one iota since I first stepped through the door back in 1985 – 26 years and the floor-to-ceiling, rustically-appealing wine racks are still the same dusty dark brown. To boot, the Wine Cask still faithfully mails out a paper monthly newsletter, filled with lots of fun and exciting wine. Mails… as in USPS… who does that anymore? But you know what? I eagerly anticipate each issue… more so than any other newsletter. With over 25 years of reading and buying from the Wine Cask I’ve learned that sometimes the descriptions of the featured newsletter wines are a wee bit enthusiastic, with language that is equivalent to air-brushed celebrity photography… Not really misrepresentation or false advertising, just one person’s interpretation… I’ve learned this the hard way… need I say more? Is it possible to have too many good vintages? Some Piemontese producers must be wondering this as their cellars are full of Barolo and prices appear to be dropping. We are certainly glad to take some stock off their hands. This is the second vintage in a row that we are able to sell for $29.99 from Principiano. The 2006 is a ripe, full bodied Barolo with deep yet delicate fruit and impressive yet flexible tannins. Decant this or let it breathe for a few hours to allow the flavors to knit together. Or age this impressive red for another five years. A great wine for a roast leg of lamb. Am I angry? No. Given my relationship with the Wine Cask, if I complained I am sure they would happily refund my money. Besides, I didn’t follow my own rules of engagement: buy a few test bottles before committing to a full case – My bad, in other words. Why not return the wine anyway? Despite what many people say about me, I’m an optimist when it comes to wine. I’ll hope that sometime over the next 20 years, this wine will blossom. I’ve been witness to this kind of transformation before, so it is not impossible. Bottle variation is a specter as well, although what I tasted does not suggest issues with bottle variation. The wines of Italy used to be wines of tremendous value, not always the finest or most ageworthy, but just good, solid values. Then something changed… a string of successive vintages where the flagship wines of Barolo, Barbaresco, Brunello di Montalcino and those pesky “Super Tuscans” were all absolute gems! Say goodbye to value and hello to the inevitable price creep. All that aside, sometimes it just doesn’t matter… Last night we enjoyed a fabulous bottle of Brunello from a long-favorite producer: Castello Banfi. We have been enjoying these wines since the mid-90’s and have had the fortune of collecting a nice little vertical.. Well the 2006 needs to find a way into our cellar – magnificent, majestic with refined, yet potent tannin. Deep, dark fruit core with a wonderful melange of flavors: anise, cherry, cocoa dust, saddle leather and violets delight the palate. Long on the finish, smooth, suggesting many years of aging potential, perhaps 15+ years. The wine went perfectly with our food: a perfectly trimmed filet and a gigantic stuffed veal chop – Heaven! Both recipes involve shaking the ingredients with crushed ice and straining into a cocktail glass. Shake the spirits and the juice of one orange wedge with crushed ice. 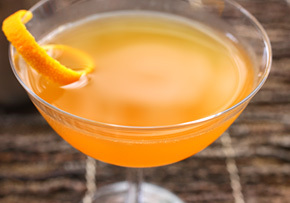 Strain into a cocktail glass and toss in the remaining orange wedge. Last up – Punt e Mes Vermouth – Punt e Mes literally means “point and a half” in Piedmontese. 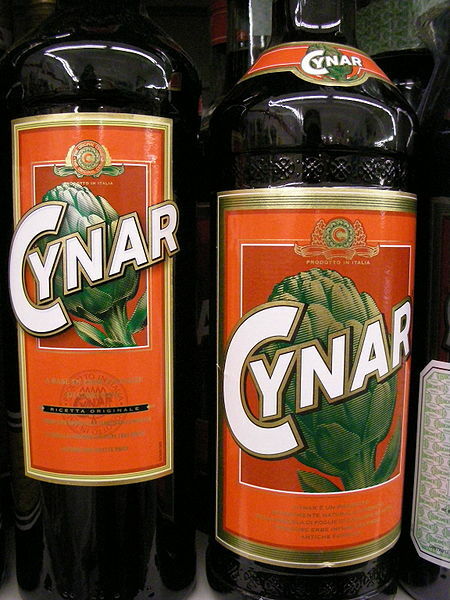 It has been said that it owes its name to a sudden raise of the stock market (naturally, of a point and a half) which greatly benefitted the Carpano distilleries, which then created the vermouth brand to commemorate the occasion. Alternatively it may refer to the flavor being characterised as one ”point” of sweetness and half a point of bitterness. Punt e Mes can be used interchangeably with any other Rosso Vermouth, or in a cocktail of its own design. So ends the journey for now… The moral of the story is to always keep an open mind and expect the unexpected. Shake liquors with crushed ice and strain into a cocktail glass. 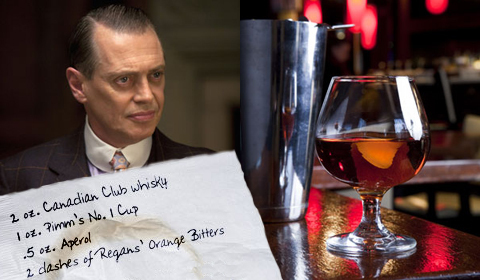 Top with two dashes of Regans’ Orange Bitters and garnish with an orange peel. Corpse Revivers were a brand of pre-prohibition cocktail meant to be consumed before 11:00am as a bit of the “hair of the dog,” if you will. 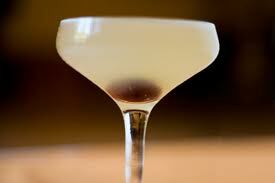 There are in fact three Corpse Revivers, #1, #2, and, you guessed it, #3. Shake with crushed ice and strain into a (chilled) cocktail glass. After such a long week and to celebrate the return of our AC, I present an historic cocktail… Lucien Gaudin (September 27, 1886 – September 23, 1934) was a French fencer and olympic champion both in foil and in épée competition. He received gold medals in both foil and in épée (solo) at the 1928 Summer Olympics in Amsterdam. He also received gold medals in foil and in épée (team) at the 1924 Summer Olympics in Paris. Shake with crushed ice and strain into a chilled cocktail glass. The Dubonnet Cocktail is said to be the favorite of Queen Elizabeth II, although her mother preferred the drink served on the rocks. 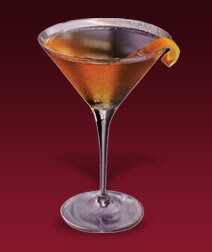 Originally an un-garnished cocktail from the 1930’s, today the Dubonnet Cocktail is often served with a twist of lemon (sometimes an orange peel). The cocktail is also known as a Zaza in certain circles. Shake with cracked ice and strain into a chilled cocktail glass. Garnish with the lemon twist.